Edirne (pronounced eh-deer-neh) is a city in Eastern Thrace, in northwest Turkey. It lies on the gently rolling Thracian plains (much of the city is fairly flat, though) and just east of confluence of Maritsa, Tundzha, and Arda Rivers, known in Turkish as Meriç, Tunca, and Arda, respectively. This city can be your first or last destination in Turkey, depening on the direction of your itinerary, as it is located on an intersection where borders of three countries meet: Turkey, Greece, and Bulgaria. Visiting this city is also feasible as a long day trip from Istanbul. With the completion of the motorway from Kapıkule, the main border post of highways from Europe into Turkey, in early 1990s, the city lost much of its trade evolving around land-based travellers heading east and members of Turkish diaspora in Europe heading for their ancestral hometowns in their annual visits. Today most of tourism in the city takes place around daytrippers, Turkish and foreigner alike, from Istanbul and visitors from Balkan countries looking for cheap goods in the market. The imperial past is what makes Edirne interesting, from huge Ottoman imperial complexes to neo-classical architecture of downtown shops, although at first sight, all you’ll see will be concrete apartment blocks when entering the city (and Selimiye Mosque right in front of you). Local Tourism Department of Government (İl Turizm Müdürlüğü), Talatpaşa Asfaltı 76 (100 m from the corner of Saraçlar Caddesi), ☎ +90 284 225-30-29, fax: +90 284 213-30-76. Tourism Information Office (Turizm Danışma Bürosu), Hürriyet Meydanı 17, ☎ +90 284 213-92-08, fax: +90 284 213-92-08, e-mail: edirnetourisminformation@gmail.com. The area around Edirne, thanks to its strategic position on the major routes towards Istanbul, Bosphorus, and onward to Asia, is one of the spots on earth that was heavily fought for—it has been site of no fewer than 16 major battles and sieges, since the days of Ancient Greece. Edirne’s former name is Adrianople (Hadrianopolis), i.e. “City of Hadrian”, named after the Roman emperor who founded the city on the site of Thracian village of Uskudama. Then in 14th century, Ottomans captured the city and made it their capital, a situation which lasted until the Fall of Constantinople. Even after the dynasty moved to Constantinople in the mid-15th century, Edirne was one of, if not the most, important centres of the European part of the Ottoman Empire, which once extended all the way well into Hungary, and still was a semi-capital of the empire, with some sultans even favouring the city over Istanbul and mumbling (to no avail) about returning the throne back to the city. Between 1700 and 1750, Edirne was the fourth-biggest city in Europe, with an estimated population of about 350,000 people. However, things dramatically changed with the beginning of 19th century, and the city suffered heavy depopulation in the context of Russo-Turkish wars of 1829 and 1878, when Russians occupied all the way to western suburbs of Istanbul; the Balkan Wars of late 19th/early 20th century; the loss of much of the hinterland and even outer suburbs to the north and west when international borders non-existent before (when all was part of Ottoman Empire) were created close to the city in 1910s and 20s; and the Second World War, when Nazi armies were only miles away from the city, just on the opposite banks of the rivers, and most of the population was evacuated into interior Turkey. Some of those who could not flee died of famine during this period. This depopulation trend slowed but continued until very recently, and the city is now home to barely 140,000 people. Although it is quite a lively city, especially compared to other Turkish cities of this size, all you see today is just a fraction of its former glory. The major streets of the city all fan out of main square, which is surrounded by three imperial mosques of Selimiye, Üç Şerefeli and Old Mosques — Talat Paşa Bulvarı lies towards east, eventually turning into the highway to Istanbul, while Londra Asfaltı leads to Bulgarian border at Kapıkule in the west, via Gazi Mihal Bridge across Tundzha. To north, Hükümet Caddesi connects city centre with the former palace neighbourhood in Sarayiçi and to south pedestrianized Saraçlar Caddesi lies, extension lying on the edge of old city and open to vehicular traffic of which eventually leads to Karaağaç across Tundzha and Maritsa. Temperate continental — hot and occasionally rainy (as showers which tend to last for 15–20 minutes) summers (expect up to 40ºC); cold and rainy, occasionally snowy winters (expect down to -10ºC). Spring and autumn months tend to be warmer than the locations on the sea coast (such as Istanbul)—so if day-tripping from a coastal place during those months, especially in May, drink plenty of water to avoid headaches due to dehydration—but winter arrives earlier (in November). Because Edirne lies in a geography that is the entering point of many weather systems from Balkans (Southeastern Europe) into Turkey, a good way of forecasting the weather conditions for the next few days is to follow what other Balkan cities such as Plovdiv, Bulgaria, is experiencing, as quite the same conditions will be what Edirne is experiencing within a two or three days time. Due to cold and dry winds of winters, packing along some kind of skin moisturizer in addition to warm clothing is essential to avoid badly dried skin (which can go as far as bleeding in coldest days). Of the nearby airports, the most convenient is the Istanbul New Airport, which has direct flights from all inhabited continents. Easiest way to reach to Edirne is by bus from Istanbul. Departures are at any time with a fare of some €10 and a trip of two hours, although stiff competition between the bus companies may sometimes result in fares as low as 10 TL pp. 41.6319826.618141 Bus station in Edirne is located way out of the city but public buses will take you to the city center. There are no direct buses to Bulgaria. It is, however, possible to take a taxi to Kapikule on the Bulgarian border. From there one can sometimes wave over a bus traveling on to Plovdiv and Sofia. Another approach could be to walk across the border and take a bus or train from Kapitan Andreevo on the Bulgarian side of the border. A single regional train per day leaves Kapikule, 18 km west at the Bulgarian border, around 07:00, stopping at Edirne at 07:30, and reaching Istanbul Halkali around 11:30. The return train leaves Halkali at 18:00, reaching Edirne around 22:00 and Kapikule by 22:30. Use local transport (e.g. dolmuş) between Halkali and Istanbul city centre. It's also possible to travel on the overnight train from Bucharest and Sofia, however note that it arrives at Edirne around 3AM. These trains are operated by TCDD. Additionally, Optima Express operates an auto-train from Villach in Austria a few times per month during April-November. This train is quite popular with drivers wanting to avoid the rather tricky roads in the Balkan. The train is however open for passengers without cars. The main station 41.655226.58012 Edirne Gar is 4 km east of downtown, close to the main highway eastwards to Istanbul where international trains call. The regional train also calls at 41.66926.55533 Edirne Şehir only 1 km SW of the centre, on the edge of the old quarter (Kaleiçi) close to the banks of River Tundzha. Nearby Kastaniés, across the border in Macedonia, Greece sees daily trains from Alexandroupolis with connections from Thessaloniki operated by TrainOSE. The city is on the main highways linking Turkey and Europe (road numbers: toll-free D100 and toll-road/motorway O-3/E80). A drive takes no more than two hours from Istanbul (224 km away) to Edirne on the motorway, even less if you drive very fast. The main European-Turkish border post Kapikule/Kapitan Andreevo (between Turkey and Bulgaria, SE of Svilengrad) is about 15-20 km away from the city, while less significant Pazarkule border post (between Turkey and Greece, north of Orestiada) is even nearer. Almost entirety of Edirne is in walking distance, which is made even easier by the mostly flat topography of the city. However for some relatively distant places you may take taxi which will cost only a few euros. There are also lots of minibuses heading for outer neighborhoods of the city. The sights in Edirne can be roughly grouped into those that are in downtown, those in northwestern neighbourhoods (Sarayiçi, and Yeniimaret) across the Tundzha River, and those in southwestern neighbourhood (Karaağaç) across the Tundzha and the Maritsa Rivers. A good number of medieval bridges span these rivers. Main sights in downtown are quite close to the main square and to each other, and can be (hastily) done in half a day. 41.67805626.5594441 Selimiye Mosque (Selimiye Camii) (at the central square). That mosque which dominates the skyline of the city, built on a slightly higher hill than its surroundings, although a play on dimensions makes the exterior sight of the building smaller as you get closer to it. A grandiose piece of art by Mimar Sinan, the Ottoman architect of 16th century, Selimiye is usually considered the zenith of Ottoman architecture and has been listed as a World Heritage site by UNESCO in 2011. Sinan himself considered this building as his best work. The dome of the building, which hangs high over main hall, encloses a huge space which gives the place an expansive atmosphere, had the largest diameter (31.28 m) of all domes in the world for several centuries. And its minarets (towers) are the second highest minarets (70.89 m) in the world, surpassed only by Qutb Minar (72.50 m) in Delhi, India. The mosque has 999 windows, which according to its architect, Sinan, symbolize the perfectness of God, through the imperfectness of the mosque he designed. The dome and interior walls are decorated with calligraphy and geometrical designs, most of which are painted in hues of pink and blue. If you have admired Blue Mosque (Sultanahmet Mosque) of Istanbul, you’ll sure adore this one, since Blue Mosque is quite a copy of Selimiye. The upside down tulips, which are some sort of symbol of Edirne have their origin in a tulip illustration engraved on a marble in the fountain right under the central dome of Selimiye. It is believed to symbolize the landlord of the tulip garden on which the mosque was built, who was said to be reluctant to give over his garden. Free. 41.67671226.5557042 Old Mosque (Eski Cami) (at the central square, across the street from Selimiye). The smallest—and the oldest—one of three nearby, imperial mosques in downtown Edirne, it is known for its calligraphic inscriptions on its interior walls with a small central dome atop. Free. 41.678126.55353 Üç Şerefeli Mosque (Üç Şerefeli Cami) (just north of Old Mosque, close to Selimiye). This mosque is easily recognizable, having four distinctive minarets that all have very different designs, uncommon during the 15th century, one of which has three balconies, giving it its name which literally means "three balconied". Long undergoing restoration, interior of the mosque, which features a colourfully decorated central dome, smaller surrounding domes of varying sizes each featuring a different colour pattern, and very stately columns supporting them, has recently been re-opened to visits. The overall experience of this colourful mosque is perhaps best summarized as "joyful". Free. 41.6774726.552294 Macedonian Tower (Makedonya Kulesi) (just across the side street from Üç Şerefeli). The sole still intact tower of Edirne's city walls, named as such perhaps because it roughly watches the direction of Macedonia, or because of the former definition of "Macedonia" which extends all the way to Edirne. A round and robust tower, not unlike Thessaloniki's White Tower except its colour, and next to it is the last visible section of city walls, now surrounded by a nicely landscaped park. It is possible to enter the tower itself, but impossible to climb upstairs. It is located in a back alley, so while you are near the Üç Şerefeli, look around on the top of buildings to see the flag on a tower made of red-brick if you can't exactly locate it. The tower also served as a clock tower until 1953, when the upper part of the tower was demolished because of the danger of collapse. Free. 41.67833526.5524895 Sokullu Mehmet Paşa Hamamı, Çavuşbey (Hükümet Caddesi, near Commercial Bank). This hammam is another masterpiece of Sinan, the Grand Architect. Built in 1568-69 the baths are still open to the public. There are separate parts for men and women. 41.6789326.560826 Museum of Archaeology (Arkeoloji Müzesi), Alipaşa Mahallesi, Kadirpaşa Sokak 7 (behind Selimiye), ☎ +90 284 225-11-20, fax: +90 284 225-57-48. An original prehistoric dolmen moved from its original setting and a reconstructed Thracian hut—typical of those used by the ancient folk of the region—is among the displayed in the garden of the museum. 41.675526.55318 Saraçlar Caddesi. A pedestrianized shopping street with pleasant cafés on sides. The old shop buildings on this street have a neoclassical architectural style. 41.674226.55039 Old quarter. Locally named Kaleiçi, i.e. "walled city", this is the oldest part of the city although the city walls and gates vanished long ago. Built in a grid plan in the aftermath of a big fire in late 19th century, the main artery of this part is Maarif Caddesi, which lies two blocks west of Saraçlar Caddesi. Along the side streets and Maarif itself line a number of elaborate wooden houses, the walls of which are with highly delicate handwork, though some are derelict. At one end of the street is the 41.671626.5515810 Grand Synagogue. As Edirne was one of the main destinations of Jewish settlement in the Ottoman Empire after the Spanish expulsion of 1492, the synagogue, built in 1907 after the great fire, is the largest in Turkey and all of the Balkans, and the third largest in Europe. Having lacked a congregation since the 1980s as more and more of the local Jews left for larger cities in Turkey and for Israel, it remained in ruins until 2015 when it was restored with a colourful look inside out and re-opened with a service. In one of the side alleys of Kaleiçi lies a small stone church, where the Catholic community of the city held masses. It is part of a local primary school (İstiklal İlköğretim Okulu) nowadays. Numerous small Ottoman mosques are also scattered around Kaleiçi and elsewhere in downtown. 41.6752626.5754811 Şükrü Pasha Memorial and Balkan Wars Museum (Şükrü Paşa Anıtı ve Balkan Savaşları Müzesi) (just next to city cemetery, on the highest hill of the city, where that large flag is located). This is a monument dedicated to Rüştü Pasha, the commander of the defending forces of the city during the Balkan Wars. Next to it is a small museum with various weapons (such as a small cannon) used during the war. While the place is slightly away from the downtown and is off the usual trail between the main sights, it occupies the highest hill in the city and offers a wide panorama of the city and the forests surrounding the rivers behind. Free. 41.682426.564812 Muradiye Mosque (Muradiye Camii) (north of downtown, close to the bridge of Sarayiçi). Free. 41.66343126.56411913 Church of Sts. Constantine and Helen. Across the Tundzha from downtown, in the northwestern outskirts of the city lie Sarayiçi, literally “inside the palace” and Yeniimaret. Both are linked to city centre by their respective medieval bridges. Most of the monuments around this section of the city were actually located in city’s suburbs, however the depopulation of the city resulted much of them now lying in the middle of open fields. 41.690626.55615 Sarayiçi. Upon crossing a long bridge over the Tundzha, you will arrive on an island surrounded by two branches of the Tundzha (though not immediately recognizable as such while you are actually on it). A modern stadium in which annual wrestling competitions take place, surrounded by some statues of past champions welcome you to the island. Just next to it is the Justice Tower (Adalet Kasrı), a sturdy square tower and the sole completely intact remnant of former imperial palace of Ottomans here. Next to the Tower, a smaller bridge on the narrower branch of the river surrounded by some centuries-old ash trees will take you back to the “mainland”. About 100m to the right, is the monument to the soldiers fallen at the Siege of Edirne in 1913 (Monument to the Martyrs of Balkan War/Balkan Savaşı Şehitliği). The monument itself, which is a recent construction with an older one hidden behind the bushes nearby, is of little interest, typical of many such Turkish monuments built to commemorate World War I and previous battles in, say, Gallipoli. However the site is actually mass grave of an estimated 30,000 soldiers, so appropriate respect should be shown. Further away from the river are the ruins of a number of buildings of the former palace scattered around the fields, which had the unfortunate service as an arsenal during the siege of 1913, and had been blown up in order not to fall in hands of Bulgarians, the foes in the battle. Although Edirne had lost the distinction of being a capital in 15th century, it was still the favourite summer retreat of Ottoman dynasty, featuring numerous hunting manors on the edges of the actual palace. Ruins are now undergoing a slow restoration (or perhaps reconstruction), with the imperial kitchen has returned to its pre-1913 appearance recently. An illustration in front of the gate of the palace building—the only part of the building that escaped the blast—may help you envisage what the palace looked like. Free. South of Sarayiçi is the neighbourhood of Yeniimaret, which, like Sarayiçi, is connected to the downtown by two bridges with an island on the Tundzha in between and is where the Medical Museum is located. 41.68583326.54361116 Medical Museum (Sağlık Müzesi), Beyazıt Külliyesi, Yeniimaret (close to the banks of Tundzha), ☎ +90 284 224-09-22, fax: +90 284 224-65-00, e-mail: kulliye@trakya.edu.tr. This museum, which was awarded “European Museum of the Year” in early 2000s, was essentially a mental institution used during Ottoman times, part of Beyazıt Complex (Beyazıt Külliyesi). It was notable for its progressive or alternative approach towards its patients. Instead of locking them into cells with shackles, which was widespread during that time, methods such as meditative music or flower gardens were tried in this institution. Today, many Ottoman miniatures from medical schoolbooks and elsewhere and models of patients are among the displayed. South of Yeniimaret, due west of city centre is 41.676626.541817 Gazi Mihal Bridge (Gazi Mihal Köprüsü), a long arch bridge built during Byzantine period and then repaired in 1420 that spans the Tundzha and lies just next to the main highway to Kapıkule border post from city centre, and the adjacent Gazi Mihal Mosque (Gazi Mihal Camii), built by Gazi Mihal Pasha, an Ottoman commander of Bulgarian origin. These are better accessible from city centre rather than from Yeniimaret, though a stroll along the dykes along the Tundzha will bring you here too. 41.68674626.51896218 Hıdırlık Tabyası (Hıdır Baba Tabyaları). A redoubt / fortress west of the city center, which is currently being restored. Magnificent view of the Thrace plains. Take the bus 3A from the city center and ask for “Hıdır Baba”. Southwest of downtown is the quarter of Karaağaç (pronounced kaa raa aa ach), the only Turkish territory west of Maritsa River, which forms most of Turkish-Greek land border. Two Ottoman bridges connect Karaağaç to downtown, which are well worth a look—pick these if you don’t have time to check out any other bridge around the city. The first and shorter one, just southwest of the edge of old quarter (Kaleiçi) and actually quite close to the Synagogue at the end of Maarif Caddesi, spans the Tundzha. About 250 m further, you’ll arrive at the second one, which spans the Maritsa and is gloriously longer than the first one, as the riverbed is gloriously larger, not much unlike that of Danube. Right at the midpoint of the bridge, there is a lookout in typical Ottoman style. A 2½ km-long cobbled road through a lush forest links the Maritsa Bridge with Karaağaç. On the way, there is an urban forest named Söğütlük (admission 2 TL pp), a favourite weekend picnic spot of locals which extends along the bank of river. Karaağaç has an atmosphere more of a town rather than a city neighbourhood, with some charming mansions scattered around its grid plan. At the southwestern end of Karaağaç is the historical building in late Ottoman style of the 41.651526.521919 Trakya University Faculty of Fine Arts (Trakya Üniversitesi Güzel Sanatlar Fakültesi), placed in a pleasant garden (free admission). The building, which dates back to the final years of 19th century, was built as the main train station of the city as the steam locomotive at the backyard still attests, and had that service for years until 1970s when it was abandoned after a new railway straight to the city was laid, due to the increasingly inconvenient operation of former railtracks crisscrossing Turkish-Greek border as the relations between two nations detoriate. The university took over in 1998. At the side of the building is Lausanne Monument (Lozan Anıtı), a metallic structure of three columns symbolizing Turkey (the longest one symbolizes Asian Turkey, the middle-sized symbolizes Eastern Thrace (European Turkey), while the shortest symbolizes Karaağaç itself, being the only Turkish soil west of Maritsa River, in other words west of Eastern Thrace) with a lady in the middle holding a sheet of paper, presumably symbolizing Treaty of Lausanne, in which major western powers recognized the newly founded Turkish Republic in 1923. Behind the monument, in the shades of a pine woods is an open air sculpture exhibition (free admission) which contains marble statues chipped in situ by sculptors from neighbouring countries. 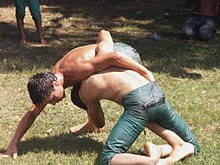 Watch an oil-wrestling (yağlı güreş) competition, the national sport of Turks (although surpassed a little by soccer lately), which annually takes place in the 41.689526.5581 stadium in Sarayiçi, northwestern outskirts of the city, on the banks of Tundzha. (Although dates vary year to year, it always takes place in late spring or early summer, such months as May, June or July.) This is the most prestigious wrestling tournament in Turkey and the winner is titled başpehlivan (“chief of all wrestlers”) of the year. Edirne is famous for its fruit-shaped soaps. They are not used for cleaning (although they can clean as well as other soaps do) but for decoration. Within the first months you put them into a room, they also work as natural air fresheners by releasing their fragrances. Almond paste (badem ezmesi) is a local, soft cookie-like dessert which is made of bitter almond. 41.6778326.552661 Keçecizade, Hükümet Cad. 5 (the central store; they also have stores at various other places throughout the city) (opposite Üç Şerefeli), ☎ +90 284 225-24-81, fax: +90 284 213-30-60. Perhaps the most well-known producer of almond paste, which also offers a variety of other traditional and local desserts. Brooms — While it may be a bit strange to buy brooms as a souvenir from a trip, Edirne has a long tradition of broommaking and ornamental brooms (traditionally given to brides as a gift) can be found at numerous stores (especially at those offering tourist souvenirs) around the city. Edirne has numerous Ottoman covered bazaars. 41.6777826.558492 Arasta (just under the outer yard of Selimiye Mosque, signposted “Çarşı Girişi”). The smaller bazaar of the city where the offers of stores range from fruit shaped soaps (a basket of which start from 3 TL) to almond paste, cheap t-shirts and shoes, and Edirne-related (and especially Selimiye-related) souvenirs and trinkets. 41.6756226.552743 Alipaşa. A bigger bazaar lying long in parallel with Saraçlar Caddesi. Liver (ciğer) is a definitely must-try for non-vegetarians. It is prepared in a unique local way (whole pieces, not puree, of liver, covered in flour, are deep fried inside a cauldron full of boiling vegetable oil) and served with an infernally hot dried and crunchy pepper. If you are one of those who don’t like liver because of its distinct smell, you can be pretty sure you won’t sense it in Edirne liver. Best to be eaten with ayran, a salty yogurt drink because it’s one of two things (the other is bread, which fortunately is served free of charge at liver restaurants) that can suppress the fire the dried pepper leaves on your palate. There is a cluster of small sit-in eateries (ciğerci) in the park next to the Old Mosque (Eski Cami), all offering basically the same menu (i.e., the fried liver), and a really filling portion of liver costs 9 TL in any of them. They also order other meals from other nearby restaurants for those who are with you and do not want to eat liver. Yudum at one corner of the cluster is good, clean, and efficient. [dead link] Ciğerci Kemal, Alipaşa Orta Kapı Cad. no: 3, ☎ +90 284 213 64 75. Local fried liver restaurant. From 9 TL. Soylu Tava Ciğer Döner / Mehmet Soylu, Hasan Sezai Türbesi karşısı, Bostanpazarı, ☎ +90 284 214 17 67. [formerly dead link] Köfteci Hocaoğlu, Saraçlar Caddesi 73, Zindanaltı (at one end of the pedestrianized section of Saraçlar Caddesi), ☎ +90 284 214-73-00, e-mail: koftecihocaoglu@hotmail.com. A local restaurant specialized in meatballs (köfte) that are not extraordinary but is quite tasty and okay. Quite clean restaurant with not so long waits, though could be more efficient in service. Overlooks the pedestrianized shopping street of the city, so it's good for people watching. From 12 TL pp for a portion of meatballs, a soft drink, salads, and dessert. Compared with most cities of its size in Turkey, Edirne is full of birahanes (pubs) and restaurants that serve alcohol. There are some particularly nice ones by the river on the road to Karaagac. There is an open-air café (Sera Café) amidst a beautifully landscaped park in front of Selimiye where you can have a cup of tea or coffee and watch the city. 41.662926.55291 Protokol Evi (at the end of Maritsa Bridge towards Karaağaç). Run by city council, this is an open air cafe immediately on the banks of Maritsa with a pleasant building historically used as a checkpoint at the entrance of the city. Elegantly decorated with wrought iron chairs and tables, the cafe has a distant view of Selimiye above the trees on the opposite riverbank. Only hot and soft drinks are served (that means no snacks!) 0.50 TL for a glass of tea. Tourism in Edirne is on the rise and hotel scene is improving with many nice hotels to stay. [dead link] Şaban Açıkgöz Hotel, Çilingirler Cad. no: 9, ☎ +90 284 213 03 13 (info@sabanacikgozhotel.com, fax: +90 284 213 45 16), . 28 standard rooms and 6 suites are available in the hotel with 74 beds in total. There are bathrooms with hair dryer and 24hr hot water, 32” LED TV with satellite connection, air conditioner, free Wi-Fi and mini refrigerator in the rooms., e-mail: info@sabanacikgozhotel.com. 41.6763726.551811 Antik Hotel, Maarif Caddesi 6 (in the old quarter), ☎ +90 284 225-15-56. Clean hotel with great views of the mosques, housed in a charming old building dating back to early 1900s on a quiet side street. Rooms with air-con, satellite TV, wireless internet connection, and en suite. Friendly staff can speak little English and some German. 100 TL. Hotel Balta, Talatpaşa Bulvarı 97, Ayşekadın (east of city centre; on the street leading to central square with imperial mosques), ☎ +90 284 225-52-10, fax: +90 284 225-35-29, e-mail: info@baltahotel.com.tr. Rooms with air-con, satellite TV. From US$60/100 single/double, including breakfast. [dead link] Efe Hotel, Maarif Cad. no: 13 (in the old quarter), ☎ +90 284 213 61 66, fax: +90 284 60 80. Rooms with air conditioner, satellite TV, hot water, and free wireless internet access. US$80 (single rooms) - US$110 (double rooms). Tuna Hotel, Maarif Cd. (close to the Antik and Efe Hotels). Nice and clean, but small rooms, which come with en suite bathrooms, air-con, satellite TV, and wi-fi. 75 TL single, breakfast included. Avoid hanging around the banks of Tundza and Maritsa Rivers and Karaağaç before, during, or after a heavy rainfall, especially in wintertime. Although the downtown is never affected, these areas tend to have a heavy flood during such a time, mainly because of overflowing of dams located upriver in Bulgaria. So if you are in Edirne in winter and plan to visit the aforementioned locations (which you should), stay ahead of weather forecasts. If you see a water rise in the river, be suspicious, call and inform police (telephone number: 155), and quickly go to somewhere as far from and as higher than the riverbed as possible. The buildings themselves in Karaağaç are rarely or lightly affected, but the problem is that the quarter is cut off from the rest of the world as the bridges which connect it to downtown Edirne sink underwater. If you are trapped in such a situation, be sure about your distance to the river and wait for evacuation crews. Because affected areas are generally the same in each flood, they are quick to respond with their boats and gear. City’s telephone code is 284 (+90 284 when calling from out of Turkey). Neighbouring countries of Bulgaria, Greece, and Romania, as well as France and Germany (which are represented by the same person), Austria, and Slovakia maintain consulates in the city. Honorary Consulate of Austria (Avusturya Fahri Konsolosluğu), Yetimler Çarşısı 9 (between Old Mosque and Saraçlar Caddesi), ☎ +90 284 212-22-68, fax: +90 284 225-10-06, e-mail: hsiragezen@hotmail.com. M-F 9AM-6PM. Consulate General of Bulgaria (Bulgaristan Başkonsolosluğu), Talat Paşa Asfaltı 31, ☎ +90 284 214-06-17, fax: +90 284 214-84-82. 9AM-6PM. Honorary Consulate of France/Honorary Consulate of Germany (Fransa Fahri Konsolosluğu/Almanya Fahri Konsolosluğu), Balıkpazarı Caddesi, Of Sitesi C Blok, D.2, Kaleiçi, ☎ +90 284 213-55-63, fax: +90 284 213-10-61, e-mail: dursunoglu_ercan@hotmail.com. Consulate of Greece (Yunanistan Konsolosluğu), Kocasinan Mahallesi, 2 Sokak, No: 12, Binevler, ☎ +90 284 235-58-04, fax: +90 284 235-58-08. Honorary Consulate of Romania (Romanya Fahri Konsolosluğu), Londra Asfaltı 64, Kıray Apartmanı, ☎ +90 284 225-56-90, fax: +90 284 225-56-90. [dead link] Honorary Consulate of Slovakia (Slovakya Fahri Konsolosluğu), Hükümet Cad. Bankalar Aralığı 1/1, Uğur Apt. (opposite Üç Şerefeli Mosque), ☎ +90 284 212-01-74, fax: +90 284 225-11-61, e-mail: info@slovakyaedirne.com. Prehistoric dolmens and menhirs are scattered around the landscape north of the city, around the town of Lalapaşa. Uzunköprü — literally "the long bridge", this town 66 km south of Edirne was named after a 15th century stone bridge of 174 arches, spanning a length of about 1500 m (4500 feet) across the River Ergene, a tributary of Maritsa, and the marshy meadows along its banks. Purportedly one of the longest medieval bridges in the world, the bridge just north of the town is still in use by the modern traffic, connecting the town to the highway D550/E87, linking Edirne with various locations south. Enez further to south on the shore of Aegean Sea is a popular town among the Edirneans to spend the summer, which features long sandy beaches and a Byzantine citadel. Istanbul to southeast, possibly with a detour via Tekirdağ on the coast of the Sea of Marmara is the obvious choice if you have just arrived in Turkey from Europe. Or taking a more southernly route across the Straits of Dardanelles towards Çanakkale via Gallipoli and from there on to Aegean Turkey. Kapıkule and Pazarkule borderposts, on the Turkish-Bulgarian and Turkish-Greek borders respectively, are just kilometres away from city. This city travel guide to Edirne is a usable article. It has information on how to get there and on restaurants and hotels. An adventurous person could use this article, but please feel free to improve it by editing the page.